In an intriguing second round match, the number 16 seed, Jo Konta will play the 2014 Wimbledon finalist, Eugenie Bouchard third up on Centre Court on Thursday. Konta had never won a match heading into SW19. Bumped up to a number 16 seed by virtue of Victoria Azarenka’s late withdrawal, Konta’s draw didn’t reflect this as she landed in one of the toughest mini-sections of the draw. In a battle of Eastbourne semi-finalists in the first round, Konta beat Puig in straight sets. The Brit rolled through the first set and came from a break down in the second set to score a superb victory, 6-1 7-5. The most impressive aspect of Konta’s game was her serve; she was serving at 74% first serves in, winning 74% of points behind the first serve and 50% behind the second serve. Puig started the brighter on the resumption of play on Wednesday and was up a break in the second set. The Puerto Rican player lost her advantage at *4-3 with a disappointing game as her second serve started to crumble a tad. Konta steadied herself to get back in the lead on serve and then managed to seal the win in straight sets, putting pressure on with some good depth on the return. Eugenie Bouchard's last win on Centre Court Wimbledon was the 2014 semi against Halep. Head-to-head record: This will be a first career match-up between Konta and Bouchard on the WTA tour. Final thoughts: I’m not sure this will be a pretty match but it will certainly be fascinating! 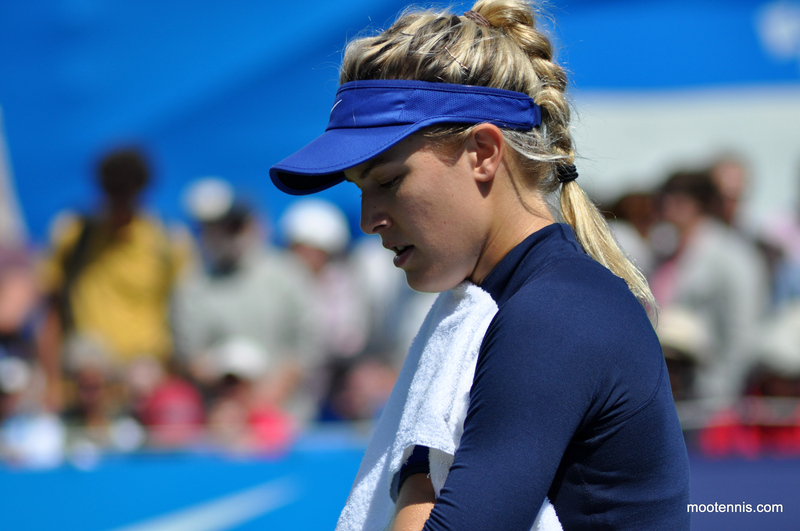 For Bouchard, i’ve been impressed with her attitude and she seems in a good place right now. Compared to the misery of 2015, Bouchard has definitely turned a corner. The results are slowly coming back but there’s still plenty of work to do. Konta’s win over Puig on Tuesday was completely overshadowed by the Federer-Willis match. I thought Konta did a superb job to close out a dangerous opponent in two sets and she really held her nerve. The way she has dealt with the pressure considering her meteoric rise up the rankings has been super impressive. It will be interesting to see the crowd support on Thursday because Bouchard is very popular. The cheer that went up on Centre on Wednesday when they revealed that her match had been moved was notable. Konta will no doubt have the majority of the support though. It’s a bit of a 50-50 match as I think one player will peak. For me, now that she’s got her first win at Wimby and with how well she handled herself in her first round, I think Konta will build some momentum and find a way past Bouchard. June 29, 2016 in Bouchard, Konta, Wimbledon, WTA. very tough to call but leaning towards Konta, Konta has a comparatively cleaner game, however Bouchard takes the ball very early so Konta may need sometime to find her rhythm. all these players are very interesting.